Dennis Maloney is a true internationalist of literature. White Pine, the press Maloney founded in 1973 and continues to run as editor-in-chief, has pointedly published literature from the Middle East, Asia, Europe, and the Americas since its inception. It is not just that Maloney edits and publishes world literature; he has also translated world literature, and even published his own books of poetry in English with foreign presses. 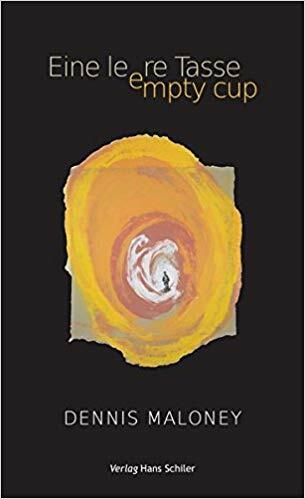 Maloney’s most recent collection of new poetry, Empty Cup (Eine leere Tasse), is currently available only in bilingual English/German format. Maloney’s biography is a portrait of the artist as global literary citizen. Maloney was influenced early in college when he attended poetry readings by Robert Bly and Kenneth Rexroth, which led him to translate the poetry of Pablo Neruda and Juan Jimenez. It was after these efforts that he first conceived of being a publisher of world literature translated into English. Maloney is also sympathetic to Asian literature and East Asian Buddhist influences on poetry, which, in the United States, naturally led to friendships with and influences from writers like Gary Snyder, Chase Twichell, and Sam Hamill. In Europe, Maloney has worked closely with and published poetry collections in English by Tomaž Šalamun and Olav Hauge. In conversation with these and other writers like Joan Murray, Patricia Spears Jones, and Sonia Sanchez — whom Maloney has read, met, and worked with as writer, editor, and publisher — he has developed a vision and voice distilled with a mature confidence, and reflecting a journey through not only the world, but a world of literature. As prologue, the poem is deceptively simple; it asks the reader how that person will read the poems and what, if anything, will be taken from them. It is a question best answered by accepting the invitation to read. “Just Enough” (“Gerade richtig”) is a collection of 64 Tanka. Tanka is a Japanese form of poetry composed of five lines, each line containing syllables in this progressive order: 5/7/5/7/7. The syllabic structure and formal play of Tanka aside, tonally Tanka can be conversational and inviting. The thematic use of Tanka traditionally is wide ranging. They can be used to tell fictional stories in long, narratively linked poems or be tight singularities of compressed observation, for example. Maloney blends these two possibilities. Through each individual poem, a lived life unfolds; the context of each single poem when taken as a collective series suggests a larger story. Just as the poet imaginatively reconnects with figures from the past by reiterating their actions in a shared place, Maloney’s imagery refigures Asian poetic language of mourning, loss, and regret. “Sleeves wet with memory” echoes “sleeves wet with tears,” a familiar way to end the Korean han style of “deep sighs” poetry written by the 16th century poetess Nansŏrhŏn. Nansŏrhŏn was likely influenced by Chinese “women poets of anguish,” such as the 12th century poetess Li, Ch’ing-chao. Maloney carries out the traditional Asian poetic practice of innovating while imitating poetry that has come before, and so in this Tanka, the past is visited in the present through not only action, but words. Writing, then, is potentially a project of the imagination, one in which the writer posits what may be instead of what is. When Maloney writes of the past under these terms, it is not a nostalgic recollection of bygone days, but a reassessment of possibility in the future based on what was. The penultimate poem in the collection, “Border Crossings,” is a long poem in twelve sections. Section one harkens back to “Letter to James Wright” in its closing three lines, “Sometimes language borders are permeable, / where breath itself is a conscious action / that travels across languages and joins us together.” It is the motivation of the breath of life that enables a connection among people — people of different times and places — and this occurs through the vehicle of language, the enactment of imagination that language provides. Tzveta Sofronieva, translator of Empty Cup, is a Bulgarian born writer and poet who lives in Berlin. Maloney and Sofronieva have worked together on other book publication projects for White Pine, and as a result, in 2014 were invited to read poetry together at a literary festival in the German city of Hausach. It was there that they met Hans Schiler, who invited them to publish a collection of Maloney’s poetry in translation with Schiler’s press. In lines three and four of this section, both words, “reflecting,” are translated differently; in line three it is translated as spiegeln while in line four it is translated as reflektieren. Spiegeln in German means the physical reflection of light, but reflektieren is much more nuanced: it could mean to reverberate, deliberate, to think about, and the physical reflection of light. Maloney’s lines carry this freight in English, but the German feels much more intentional, and for that reason, layered. The witnessed universe becomes a potentially conscious thing containing the mist of both the living and the dead. The interconnectivity of reality is therefore removed from time and is ever-present. When put in context of Indra’s jeweled net in Buddhism — what the last line appears to refer to — the description feels like a portrayal of meditative realization. The speaker has a perception absent of causation because sequences of before and after have not only fallen away but become unified by being both shared and singular reflections. The English could carry all these meanings, but the varied use of words in German evokes the nuances more clearly. This is one of many examples of Sofronieva’s proficiency in rendering the English poetry into a German semantic, and doing so with depth. A word in an unknown language. to the springs of their speech. For Sofronieva, accepting the challenges of translation is the fundament of creating poetry. It is the living human translator that bridges languages, finds and determines meaning, and then shares that meaning with other human beings. The translator, just as the poet, is an originator of language and poetry, communicating through imagination and intellect. It is easy to believe Maloney shares these ideas as a purpose in writing. The breath of life that motivates language is for him what travels through language and connects with people. Language, poetry, and the act of translation are, then, inherently communal acts because they all involve ways of knowing one’s self, sharing that self, and as a result, eliminating a sense of otherness among communities. The world, literally and figuratively, evolves. Like language and imagination, the world is always in a state of change, never static. As suggested in this poem, the work of Empty Cup — to distill life into singular moments that are nonetheless connected, to achieve a personal awareness of the past and present in a unified vision of experience, to share understanding — is a tall order. As part of the definition of what it means to be human, however, “Michelangelo’s Prisoners” sews a piece of cloth for every reader to carry, to become a part of the consciousness project Empty Cup invokes, and to participate in the unending struggle to carry the weight of the unfinished work of the human race. As an enactment, Maloney and Sofronieva’s book of poetry tells us that part of our place in this world and what it means to live in this world is knowing not only ourselves as individuals, but the life all around us. Johannes Bennke is a doctoral candidate at the Competence Center for Media Anthropology at the Bauhaus-University Weimar. He writes about the aesthetic thinking of Emmanuel Levinas and performative images in sensory ethnography. He studied philosophy, comparative literature, film and media studies in Frankfurt am Main, Berlin, Paris and Potsdam. Before his studies, he worked several years as a photographer at David Chipperfield Architects. Ian Haight’s book, Celadon, won the 2016 Unicorn Press First Book Prize for poetry and was published in the fall of 2017. He is the editor of Zen Questions and Answers from Korea, and with T’ae-yong Hŏ, he is the co-translator of Borderland Roads: Selected Poems of Kyun Hŏ and Magnolia and Lotus: Selected Poems of Hyesim — finalist for ALTA’s Stryk Prize. Other awards include Ninth Letter’s Literary Award in Translation, and grants from the Daesan Foundation, the Korea Literary Translation Institute, and the Baroboin Buddhist Foundation. For more information please visit ianhaight.com.